Virginia Opossum (pictured) are not found in the mountain regions, instead they are found at lower elevations in Colorado. They reproduce two times a year and are very prolific with sometimes as many as fifteen young per litter! 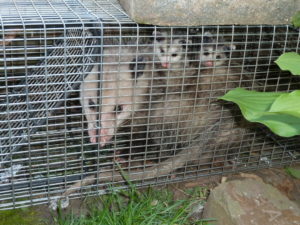 Ground trapping is the best option usually for these guys. Installation of fencing around porches, decks and sheds can permanently resolve the issue of “squatting without paying rent”!